Experienced speakers know the value of humor for adding punch to their point and muscle to their message. That's why 1001 More Humorous Illustrations for Public Speaking belongs in every pastor's and speaker's library -- including yours! 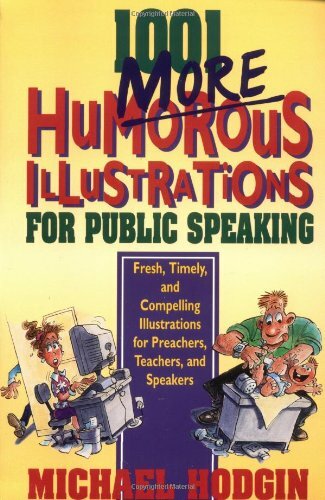 Like its rib-tickling predecessor, 1001 Humorous Illustrations for Public Speaking, this volume is a gold mine of one-liners, jokes, and humorous anecdotes for almost any situation or subject. Pick your topic: Attitudes, Evangelism, Romance, Weddings . . . you'll find what you're looking for, conveniently alphabetized, numbered, and indexed for instant referencing. There's even a space for you to record the times and places you use each illustration, so no one will hear you tell the same joke twice. Most of these humorous gems have already been tested by preachers and other speakers. And the huge variety ensures you'll find something to tickle any congregation's funny bone -- and grab its attention.